Our bodies are a complex collection of numerous biological cycles and systems that can often be difficult to fully understand. The body’s set of defense mechanisms constitute one such system. They protect us from harm 24 hours a day, seven days a week, from a whole number of things that could potentially harm us. Here are nine fascinating things your body does which you may not have even realized were ranked among those defense mechanisms. The main purpose of yawning is to cool down the brain after it’s been overheated or overloaded. Usually, we sneeze when our nasal passages fill up with too many allergens, microbes, dust, or other irritants. We instinctively stretch in order to prepare our bodies for the physical loads we expect them to take during the day. At the same time, stretching works the muscles, restores blood flow, and improves our mood. When we eat very quickly, swallow large pieces of food, or simply overeat, our pneumogastric nerve can become irritated. This is closely connected to our stomach and diaphragm. The result is a bout of hiccups. This refers to that strange feeling when you lie down to go to sleep, and as you start to drift off your body is jolted for a second by what seems like an electric shock. In this moment, all of your muscles spasm so strongly that you almost fall out of bed, and you wake up straightaway. This phenomenon is the result of the fact that when you begin to fall asleep, the frequency of your breathing rapidly falls, whilst your pulse slows down only very slightly and your muscles are relaxed. Amazingly, your brain interprets these developments as heralding death. So it tries to save you by giving you a jolt. 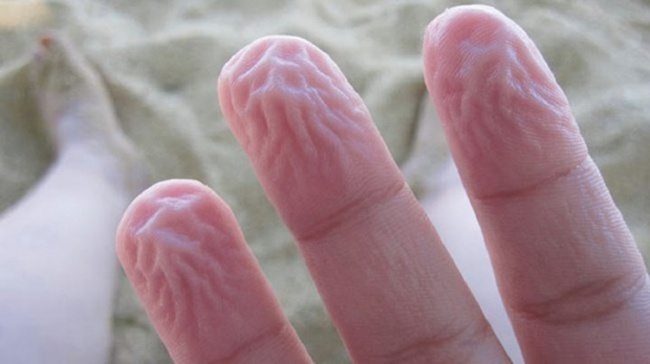 The wrinkles that appear on the skin of your hands play an important role. This phenomenon is caused by the fact that when your body encounters an increased amount of moisture it understands that the environment might be slippery. So the skin on your hands immediately begins to change in a way that will make it easier for you to grip smooth surfaces. Loss of memory often happens after the occurrence of the most unpleasant experiences. Our brains literally delete the most terrible moments from our memories. The primary function of goosebumps is to reduce the amount of heat our bodies lose through the pores of our skin, which then makes it easier to warm ourselves in inhospitable climatic conditions. Apart from acting as protection for the mucous membrane of our eye when foreign objects come into contact with it, tears serve as an instrument of “emotional defense.” Scientists believe that in stressful situations the body creates a new, powerful source of irritation in order to distract a person from the pain they’re currently experiencing. These are just some of the reasons why we should all be very grateful to our bodies for working to protect us every single day. Remember to relax — your body’s got everything covered!